Some fathers ARE spoiled! Yesterday I received this excellent gift: http://www.suluk46.com/products%20%20-%20P14%20TDW%20Stove.html It will save nearly 3 oz from my pack weight! Yesterday morning I tried boiling the billy on it…and, it is a BEAUTY. I thought NOTHING would surpass the Bushbuddy Ultra (http://bushbuddy.ca/indexs.html) but I was wrong (as usual?) The saving in weight is enough Bacardi 151 to work up quite a glow! 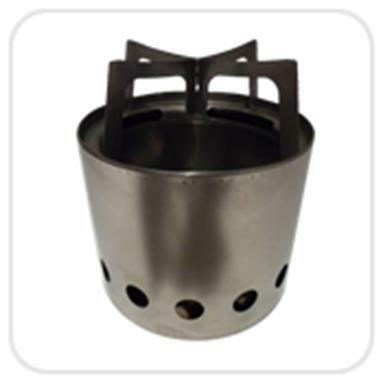 This Suluk stove actually burns BETTER than the Bushbuddy AND is easier to ‘feed’. Thanks a million Della! We use these stoves even where (open) fires are prohibited (ie canister stoves only required) as they fulfil all the requirements really, ie the fire is contained; it ‘leaves no trace’ (you can even have it burning on the palm of your hand – so it certainly won’t scorch the ground); it is not in any way injurious to the environment, which can certainly spare a handful of twigs! Of course the (true) beauty of such a cooking system is LIGHTNESS: there is no fuel to carry: this beauty weighs less than the burners of the lightest canister stove (sans canister), so prpbably represents a saving of up to half a kilo (that’s a day’s food!) on a multi-day trip!